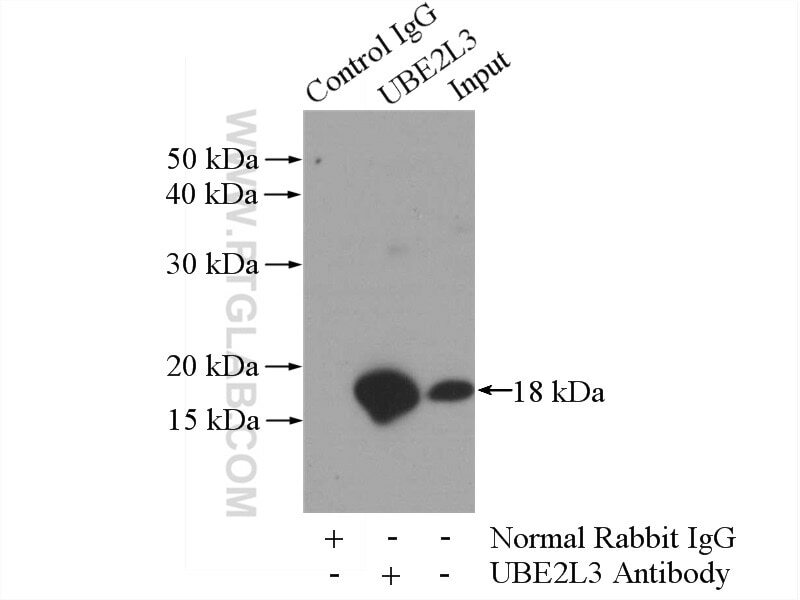 IP Result of anti-UBE2L3 (IP:14415-1-AP, 3ug; Detection:14415-1-AP 1:2000) with mouse kidney tissue lysate 4000ug. UBE2L3(Ubiquitin-conjugating enzyme E2 L3) is also named as UBCE7, UBCH7 and belongs to the ubiquitin-conjugating enzyme family. It regulates nuclear hormone receptors transcriptional activity and may play a role in myelopoiesis.UBE2L3 is associated with susceptibility to systemic lupus erythematosus (SLE) and rheumatoid arthritis in European ancestry populations(PMID:22045845). A specific subset of E2 ubiquitin-conjugating enzymes regulate Parkin activation and mitophagy differently.